Not much is known about the upcoming 14nm FinFET architecture from AMD: Polaris. What little we know comes from the revealed press decks and presentations at events like VRLA. 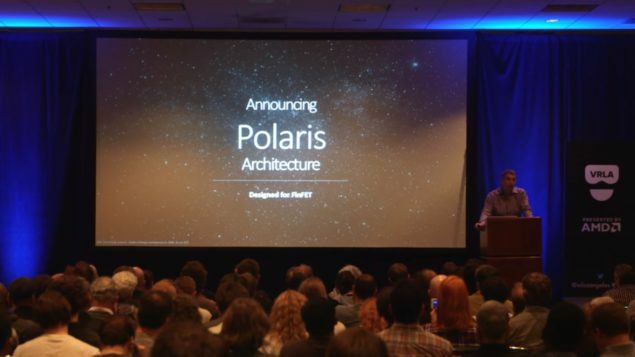 AMD’s Roy Taylor discussed the Polaris Architecture at the expo and talked about how easily Polaris GPUs can target the VR market. As most of you know, the Oculus VR headset requires a “minimum specification” of GPU to run it. This specification is currently listed as a GTX 970/R9 290 GPU and it looks like Polaris will be aimed to bring this minimum spec within reach of more people. The shift to 14nm becomes highly significant in this aspect. Not only does the die shrink allow for more transistors to be placed on the same surface area, it increases economies of scale – lowering cost. Not only that but the maturity of the process (14nm LPP has a 20nm backbone) would allow good yields and more volume to be shipped. AMD hopes to exercise this advantage by lowering the cost of “minimum spec VR” to a point below the $349 mark – making VR available to everyone and increasing the Total Available Market for VR. This has interesting implications. 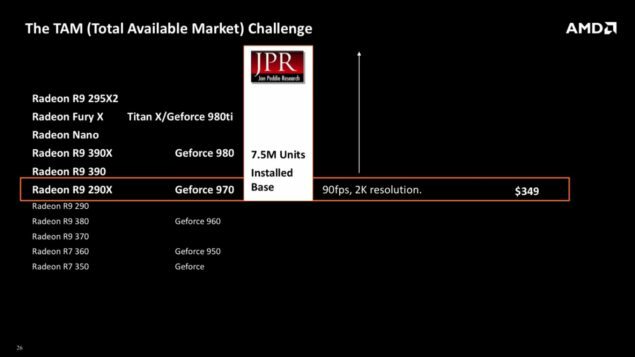 This will almost certainly mean that AMD is going to be shipping Polaris GPUs that are at least in equivalent in power to the R9 290 at a cost much lower than the $349 MSRP of the original. [Opinon] I expect we will see Polaris GPUs at the $250 mark that will match or exceed the performance of Hawaii counterparts in 2H 2016. [/Opinon] It goes without saying that this does not mean that minimum VR spec will be the limit of AMD’s 14nm GPUs – rather that the Polaris architecture is so efficient that it can be leveraged to increase sales in the lower end segments by offering more performance at the same dollar amount. The shift from 28 nm has been a long time coming, and things are about to get very exciting for PC gaming enthusiasts all over the world.